Getting fit the Etcheberry way! Ever since my good friend Doug Eng attended the first Etcheberry Experience course, I have always wanted to attend myself. Unfortunately I could never align my schedule to make it work until this past February. I was really excited that I could finally attend and become an “Etcheberry Certified” instructor. The Etcheberry Experience is a two day course with the certification testing done at the end of the second day. For those not familiar with Pat Etcheberry, he has trained world-class athletes in a variety of sports such as tennis, golf, Nascar, MLB, NHL, NBA, Sumo wrestling and motor racing. Pat has trained some of tennis’s all time greats including Pete Sampras, Andre Aggasi, Martina Hingis and Justine Henin. I have had the opportunity to see Pat speak at the USTA’s Tennis Teachers Conference as well as at the PTR Symposium so I had some idea as to what I was in for over the two days of training. Watching the DVDs was a great preparation for attending the certification course. When I arrived for the course I was met by Taryn who was our primary contact as we moved forward for the Etcheberry Experience. Taryn greeted all of us warmly and gave us the class handouts as well as our goodie bag of products that Pat endorses such as “Etch Aloe”, Verve and Vemma as well as a really nice Etcheberry Experience shirt. The course started with Pat providing an overview what was in store for us over the next two days. Each day starts in the classroom and the last half is on court and in the gym. One of the invaluable parts of the course were the stories that Pat shared about training legends such as Andre Agassi, Monica Seles and Pete Sampras. The first day on court ran us through many of the Pat’s fitness drills including his basic test to determine a player’s fitness level. The on-court session was a lot of fun and allows for you to really experience what it would be like to be trained by Pat. The second day is all about getting you ready for the certification testing. We did this by designing a training program for a client. 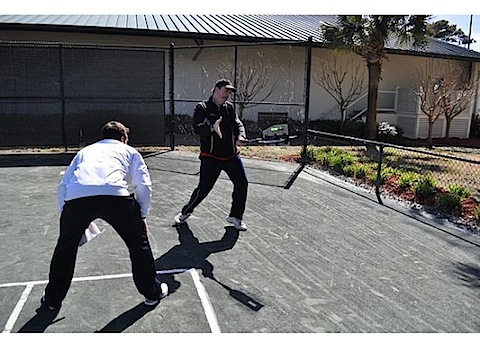 The program included a strength training, agility and tennis component. Pat reviewed our programs and made suggestions for additions to make the program more complete. After a quick lunch it was time to go on court with a partner and demonstrate the training program that we put together as part of our certification testing. This was a great opportunity to utilize many of the tools that Pat uses when training professional athletes. One of my favorites was the Etch-Swing which IMHO is a must-have tool for tennis strength training. After being critiqued by Pat, we were presented with our certification certificates and we took pictures with Pat. This was a truly enjoyable course which I learned a lot from. 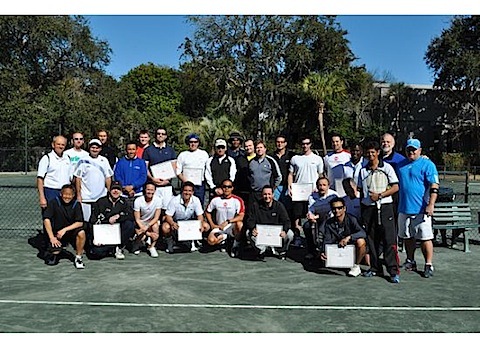 As a member of the National Cardio Tennis Speaker Team, I could see the value in incorporating many of the techniques into my Cardio Tennis classes. “The Etcheberry Certification was an excellent experience. I thoroughly enjoyed working on court with Pat and learning from him in the classroom. It was so much fun to hear some inside stories of the many Pros he has worked with; their challenges and triumphs from the practice court and on the tour. I left the workshop with the tools and knowledge to help my players become stronger athletes. I also realized that I too need to get in shape if I want to set high expectations for my players as Pat does. He demands 100% effort and motivates them to be mentally tough. I throughly enjoyed the opportunity to learn from Pat and to become ‘Etcheberry Certified’. I hope that you will take the opportunity to do so as it will help to make you a more complete tennis professional. Please visit the Etcheberry Experience website for information on upcoming Etcheberry certification dates. This entry was posted on Friday, June 11th, 2010 at 12:35 am	and is filed under Cardio Tennis, PTR. You can follow any responses to this entry through the RSS 2.0 feed. Both comments and pings are currently closed.